This article can be found at Walt’s Basement, for the Love of All Things Disney. Head on over and join them! Marvel has been hitting the ball out of the park with recent movies featuring Iron Man, Thor, Captain America, et al. So who are the Guardians of the Galaxy, and why did Marvel decide to bring them to big screen? The fact that other major properties (ie – Spider-Man, X-Men, and Fantastic Four) are in contract to other production companies, is a part of it. But maybe they decided that going with the underdogs was what Marvel does best. In the late sixties, Marvel had introduced many of the A-list characters and teams that have become synonymous with the Marvel name. But they were still recovering from the anti-comic book hysteria of the 1950’s. Many of their titles were partial reprint comics, featuring a new character or team story followed by reprint stories from their library of westerns, science-fiction, romance, etc. that had sustained them for so many years. 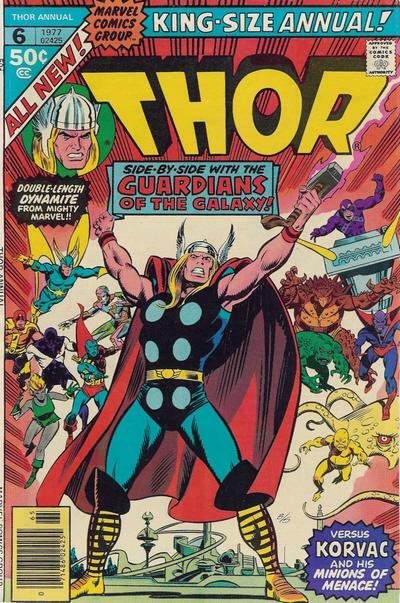 Marvel Super-Heroes was one of those titles, but in issue #18 (cover dated January 1969), the lead story featured a group known as The Guardians of the Galaxy. The time is the 31st century, and this is an alternative time-line to the main-stream Marvel Universe. The Guardians are made up of the team of Major Vance Astro, a 20th century astronaut who spent 1000 years in suspended animation on a trip to Alpha Centauri and finds humanity had arrived before him with technology discovered after his trip began. Martinex is a crystalline being from Pluto; Charlie-27, a humanoid from Jupiter that was genetically engineered for density on the gas giant; and Yondu, a native from Centauri-IV (fourth planet of Alpha Centauri-B. Each of them is the last of their respective races and they unite as a team to fight against the Badoons, an alien race that has mostly taken over Earth’s solar system. Their next appearance didn’t happen until 1974, along with two new members (Starhawk, the-one-who-knows and Nikki, last survivor of the Venus humanoids) when issues 4 and 5 of Marvel Two-In-One featured the team along with Captain America and the Thing (Fantastic Four). In 1975 they showed up again, this time teaming with the non-group known as The Defenders in issues 26 through 29 and Giant Size Defenders #5. Both of these adventures had The Guardians traveling back through time to join up with the other heroes in their ongoing fight against the Badoon. 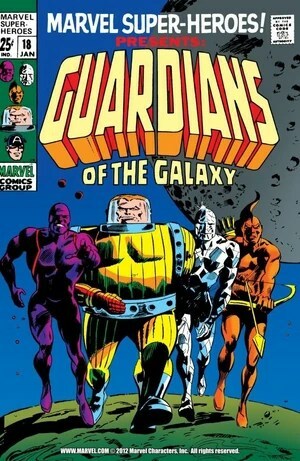 The Guardians next appeared for 10 issues of the series Marvel Presents, followed by a run of eighteen issues of various titles that brought back the villain Korvac from the Giant-Size Defenders story. Korvac had been intended as a one-shot villain, but he emerged as a major player in the Marvel Universe… the stories were known thereafter as The Korvac Saga. 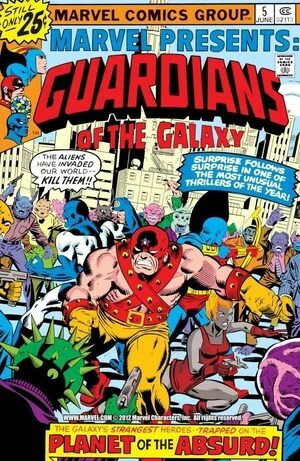 Again the Guardians disappeared from the comic racks until the early 1990’s when then got a self-titled series that ran for 62 issues. It featured the original team in their future along with some new members, incuding a Skrull (alien shape-shifter), and Inhuman (Earth based superhuman) as well as Yellowjacket 2 (Rita DeMara) and a future version of the super-hero Wonder Man who is now the sole remaining Avenger. The team decides to continue the expansion and Martinex goes in search of more members in a mini-series Galactic Guardians. So how do we get to the team that will eventually show up in the movie? In 2007 a epic storyline entitled Annihilation: Conquest ran in the Marvel Universe that brought together a group of varied galaxy spanning characters that ranged from serious to a lesser known space-farer (Rocket Raccoon) and a former Marvel monster of the 1960’s repackaged as a cosmic level entity (Groot). It was in the aftermath of this story that Star-Lord brought together the team to as he put it “on the heels of two back-to-back wars, they’re out to prevent any new Annihilation-size disasters from erupting.” The new team is based out of a space station named Knowhere. Along with some members that will not be a part of the film, they faced the Universal Church of Truth, King Blastaar (Fantastic Four villain), and two crossover stories (War of Kings and Realm of Kings) in its short 25 issue run. They then went on to tie up some loose storyline ends in The Thanos Imperative and Avengers Assemble from 2010 to 2012. Most recently the team has gotten a new series as a part of the new Marvel NOW! branding started in 2013. It has all the members we will see in the movie as well as Iron Man who is trying to expand his outlook after the events of the A vs. X storyline. So looking at the movie cast who will we see? Star-Lord (Peter Quill, played by Chris Pratt) is a thief, rogue and a bit of a jerk. Gamora (played by Zoe Saldana) was an orphan trained by Thanos to be his assassin and is now seeking personal redemption. Drax the Destroyer (played by Dave Bautista) is a warrior is search of vengeance against one of the films protagonists Ronan the Accuser (Lee Pace). Groot (voiced by Vin Diesel) is a tree-like humanoid that is both deadly and sweet, the only innocent in a group of ne’er do wells. Lastly we have Rocket Raccoon (voiced by Bradley Cooper) who is a genetically altered raccoon bounty hunter, mercenary, master of weapons, and battle tactics. Together they are the Guardians of the Galaxy… coming to a theater near you in August! Visit the Marvel boards at the Walt’s Basement Forum and join the fun! I also have this posted on Walt’s Basement at http://www.walts-basement.com (http://waltsbasement.yuku.com/topic/40808/master/1/. Join the Disney magic there every day! 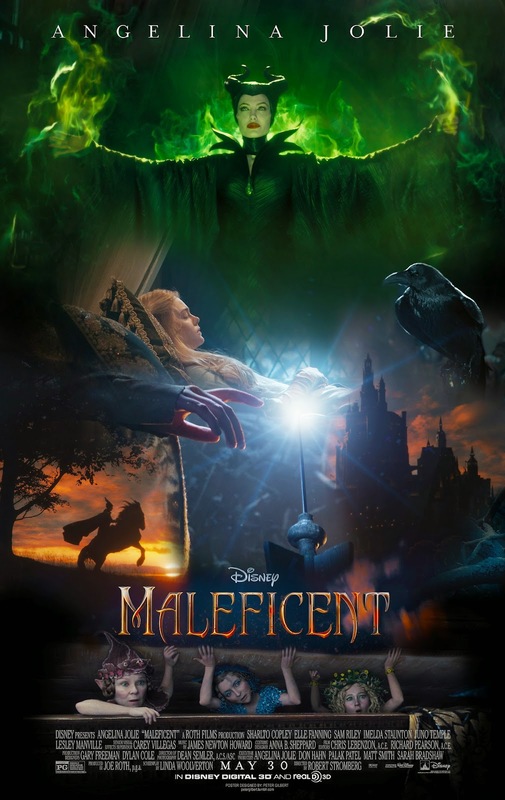 Having waited what seems like an eternity for this film (as I have been a Maleficent fan long before it became cool), I approached my experience with as much of an open mind as I could muster. I am not a fan of Angelina Jolie (never have been), so I was not very enthusiastic when I heard they had cast her in the main role of my favorite villain of all time. In fact, I was quite upset. As the months went on and Disney released preview after preview, I began to come to terms with the casting and began to look forward to seeing the film more and more. I went on opening day and saw the film in digital format (not in 3D) because I knew that if I saw it in the other formats there would be things that my eyes would likely miss due to the frame rate increase, and I wanted to see it ALL. I will go back and see it in other formats at a future date. In my opinion, Angelina nailed this role, although her acting does have limitations in one particular scene (you all will know which one I mean so I will not spoil it for you). That scene just felt underdone and a bit awkward, but in all seriousness she really did a good job with the rest of it. Her companion, Diaval (played by Sam Riley) was also done well. Sharlto Copley portrays Stefan with obsessive conviction and the efforts he displays in his scenes is almost palpable. Elle Fanning, our Aurora, does not quite measure up to the acting that Jolie displays when they share a scene together, but in other scenes (such as with the three fairies), she holds her own just fine. Other members of the cast simply do not compare to the lead characters, but it really does not matter thanks to the excellent storyline. The twist on the classic Sleeping Beauty tale is something I would have written. After all, I have said for YEARS now that Maleficent is a hero and a villain and has been misunderstood. It is a great tale, indeed, and long overdue. This film is geared towards all ages, so adults may leave with the thought as I did that it would have been amazing if it had been even darker, but this way it will not frighten young viewers much if at all. I really would have made it darker so there would have been more contrast in the characters by the end of the film. It is sweet in parts, humorous in others, and very well crafted however. The film is rated PG, however I would have no issue whatsoever taking my children, even young children (ages 6+) to the movie. There are only a couple of minimally frightening parts in the film and one bit of violence that you would need to discuss. It is comparable to PG with Marvel films or something on evening television, and good parenting opportunity always results from discussion, not sheltering. My children and all of the younger ones in the theater LOVED it! The scenery and sets are fabulous. Seriously. The CG effects are amazing and all of the creatures are completely believeable. The exception to this, in my opinion, was the three fairies. They looked a bit too CG for my taste in more than one scene. I would not be surprised to see this film nominated for an Academy Award for some of it next year. I wanted to live in either kingdom by the end of the film. The score by James Newton Howard is well done, but it is not so influential as to stand out on it’s own or able to overshadow the story, as in some films. It is comforting and relaxing in places and tense and strong in others. It fits, but it is not the high calibur of some past Disney films. I liked it because it did not take away from the focus of each scene. Great balance there. The costumes and the makeup are sensational throughout the film. Pay close attention to adult Stephan in particular! The transformations that were done are nothing short of amazing for all of the cast. Rick Baker will get most of the credit for makeup, but in reality there was a team of nearly fifty people working to get appearances right. Costumes were designed by Anna B. Sheppard and they are remarkable for Maleficent and other key characters. I was glad that Disney treated my favorite villain with the respect and dignity that she deserves, and all women (men, you too) will be able to see the symbolism behind the story that translates to some of us in reality. There’s a reason she is my favorite, and this story is told to illustrate it. My rating is 4.5 out of 5 stars. EVERY DISNEY FAN SHOULD GO SEE IT!